I seems to be spending a lot of time sitting in waiting rooms, of all kinds, and sitting in the car, on the way to places. So boring. I find that those moments are perfectly suited to knitting. Now the Innocent Smoothie hats are going to be appearing in stores this month, and any tiny hats I made would be sitting around in a box till the next call, I moved on to socks. 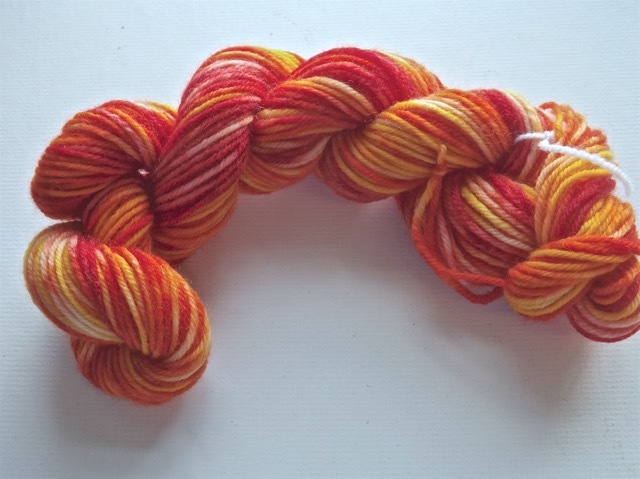 I find it super difficult to get a good photo of the yarn but maybe this will give you an idea of what it looks like – nicely mottled, firery colours (although I used Creamy Peach, Pink, and Lemon Yellow, I def. got RED, ORANGE and Yellow! Then I had to try something I saw on Ravelry, when DS woke me in the middle of the night (he is still very much on a student sleep schedule) playing the guitar. The AABBABAB dyeing sequence produced fab socks for her, less so for me, either because I didn’t measure to estimate the size my socks would be, or because I didn’t leave any of the bare yarn undyed, or because there was too little contrast between the green and the teal. But it DID give me a nifty two-colour pattern with small pools of colour – not quite stripes but not uniformly mottled like the red/orange/yellow version, where it was all just dumped into the crockpot in areas. Hard to see, again, but maybe a bit? You can see it best on the toe. So THEN I had to take some more PVC piping and make a warping board (is it really warping? I see WRAPPING as often) sort of like this one, but a bit simpler, so I could try to dye self-striping yarn! If you click the image you can go see the YouTube video of him wrapping it so you can see how it works. That worked. Dyed in the microwave, it took less time than the crockpot. Now, since I wasn’t too sure it would work, I’ve used superwash, DK weight wool yarn for all these experiments. 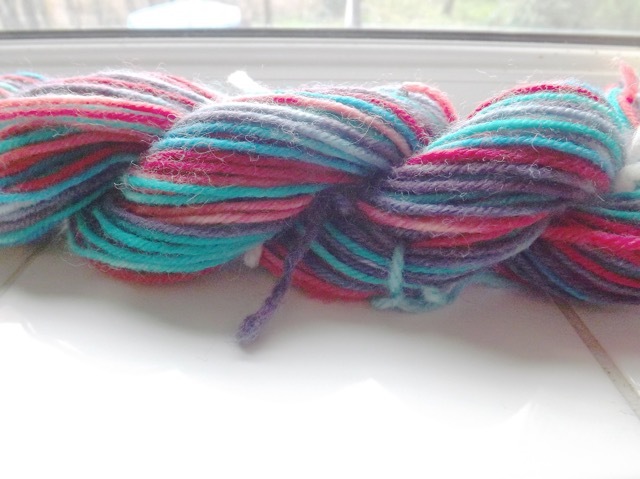 The skein fir this last one, because I was so unsure of success, was only a 50 gm skein. Not enough for even a shortie pair of ankle socks. 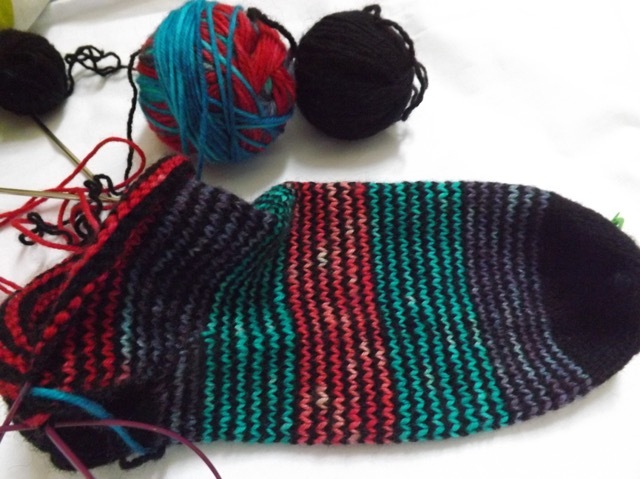 So I paired it with some plain black, knitting the toe and every other row in the black, with alternating stripes of the hand-dyed yarn. 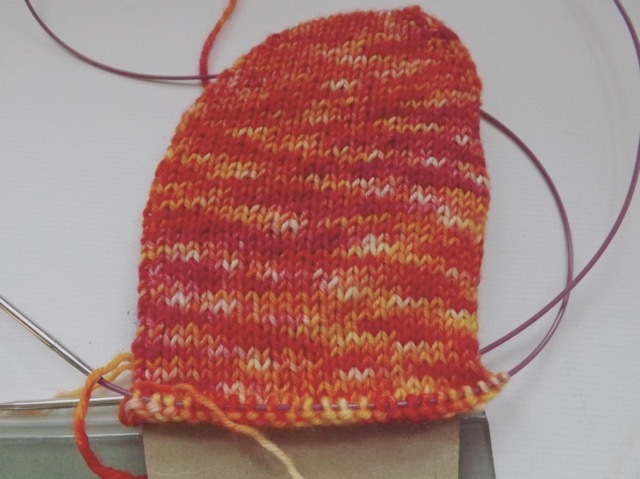 It’s working – I can clearly see that the yarn IS self-striping! Yippee! There is a pink, a teal, a purple, a cranberry, and a royal blue (just coming up on the ball) and I should be able to get two socks from the one 50 gm skein if I do the cuff in black too. It looks like I am getting about 6 rows for each striping section so I must have done something right. 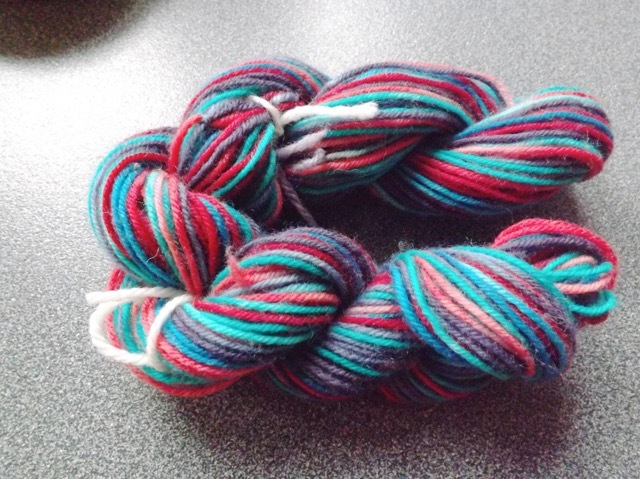 I have one other pair I made using yarn dyes with Violet food colouring, which “broke” beautifully into it’s core colours of purple, blue and pinky red, but I think the socks are in the laundry so no photo. Read about Breaking Black (although it works with Violet and some blues too) to see what THAT is all about. I do have some skeins of blank sock yarn to try next. But it is on a very long To Do list. While the knitting I can do a few minutes at a time, the DYEING takes at least a bit of focused time, and a lot of waiting – mixing the colours takes only a moment, heating the water takes ages (unattended), dumping in the dye takes seconds, waiting for the dye to absorb takes ages (unattended), cooling takes ages (unattended), rinsing takes ages (active), drying takes ages (unattended), then comes the knitting. That is for crockpot dyeing. The self-striping and the dyed-to-pool AABBABAB dyeing are MUCH more of active processes and can take a few hours. That kind of time is hard to find at the moment. Just thought I’d share, lest you think it is all about the book folding. I have a long list of printables I hope to do but now we are in 2016 and I have made so many 2016 calendars already, it’s hard to imagine doing even MORE and it’s too soon to do 2017 ones….isn’t it? Hilarious that we are dying at around the same time!! I LOVE your teal and green ones, such vibrant colours. I don’t knit so am at a loss when I have a dyeing session-but I may ask my mum to have a go at knitting up some of my yarn! I too use the microwave, a lot quicker (though I did manage to burn one lot of fabric dying last summer in the microwave so you do need to be careful!!). 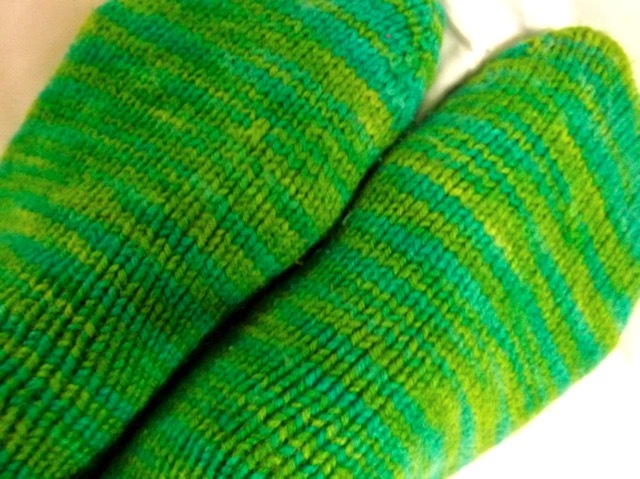 Mary Anne – you constantly amaze me with all that you accomplish – the sock yarns are great. I left off with my sock knitting at about 35 pr last spring, then knitted sweaters for the littles in October and just now am thinking about some socks for myself. Have been busy with jewelry inventory for shops and an article for magazine so some mindless knitting might just work through our rainy season. All this and still you work circles around me. Kudos! Those turned out great! Love the mix of colors.